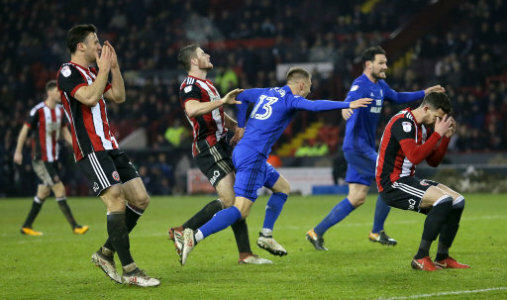 Anthony Pilkington struck an injury-time equaliser for Cardiff as they rescued a 1-1 draw against Sheffield United on Monday. A win for Cardiff would have equalled a club record of nine successive league wins, set in 1946, but they were second best for large parts and fell behind to Leon Clarke's deflected opener (28). Clayton Donaldson struck the woodwork as United wasted some glorious openings to secure the points and they were punished late on by substitute Pilkington (90+1). The result moves Cardiff eight points clear in the automatic promotion places while Chris Wilder's men are just one point away from a play-off place. The home side threatened in the second minute when Cardiff midfielder Marko Grujic got ahead of John Lundstram following a searching cross from Enda Stevens, allowing goalkeeper Neil Etheridge to collect the ball. United's Lee Evans then fired over from distance while the visitors' first effort on goal came from Zohore, who shot straight at home goalkeeper Simon Moore. The opener arrived when Lundstram slipped the ball to Clarke, whose low shot from inside the area took a deflection off Bruno Ecuele Manga and beat Etheridge. Cardiff boss Neil Warnock made a change at the break, sending on Gary Madine in place of Nathaniel Mendez-Laing. Etheridge came to his side's rescue early after in the second half, making a brave block with his legs to deny Evans, who had been put through on goal by Fleck. Clayton Donaldson was sent on in place of Brooks and he was soon in the thick of the action, firing against Etheridge's right post following a quickly-taken free-kick. Warnock then made a double substitution with Yanic Wildschut and Pilkington replacing Junior Hoilett and Zohore. The home team were made to pay for not finding a second goal when Cardiff got back on level terms after the 90-minute mark. The ball was pumped into the area and Madine headed on to Pilkington, who volleyed past Moore to keep Cardiff's unbeaten run alive. Sheffield United: Moore; Baldock, O'Connell, Stearman (Wright, 69), Stevens; Basham, Evans (Leonard, 88); Brooks (Donaldson, 72), Fleck, Lundstram; Clarke (capt.). Cardiff City: Etheridge; Manga, Morrison (capt. ), Bamba, Bennett; Grujic, Gunnarsson, Paterson; Hoilett (Wildschut, 78), Mendez-Laing (Madine, 46), Zohore (Pilkington, 78).